Successfully Added 3.5 Inch HDD Media Player Enclosure With VOB Support to your Shopping Cart. Media Player Hard Drive Enclosure for 3.5 Inch IDE Hard Disks for digital play back of media files including DIVX and VOB directly on a TV without needing a computer. 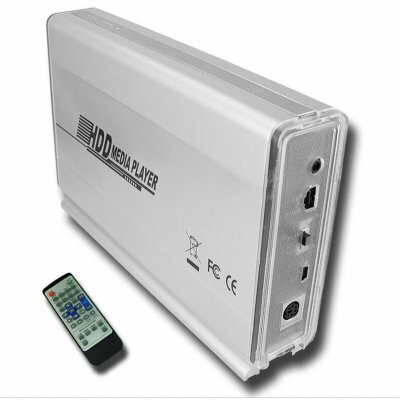 A definite must own for people looking for optimum portability and playing quality from their digital media, this HDD player comes with AV OUT as well as VGA and S-Video OUT for connection to many various monitors, as well as a missive potential 500GB of storage space. As a added bonus, partitioning of the hard disk can be done using FAT 32 or in NTFS for flexibility in how you manage the memory space. Perfect for resellers or for personal use, this HDD media player is just what is need to get the most out of digital music, pictures and movies. Very good hardware but really crappy software. No firmware update available. Plays most formats. Seems to have problems with long filenames (only seems to support 8 characters) and also too many files / folders in a folder. Also don't know where to get firmware updates as the drive is unbranded - anyone know?